So how were the ‘Cams’ by you? Based on a few reports via e-mail and my own vigil of two and a half hours centered on the predicted maximum of 2 a.m. CDT (7 UT) Saturday morning the Camelopardalid meteor shower did not bring down the house. BUT it did produce some unusually slow meteors and (from my site) one exceptional fireball with a train that lasted more than 20 minutes. I saw 10 meteors in all, most of them slow and colorful with orange and yellow predominating. My hopes were high when the shower started with a bang. At 12:34 CDT, a brilliant, very slow moving meteor flashed below Polaris at about magnitude -1. A prominent train glowed many seconds after burnout and continued to show for more than 20 minutes in the camera and telescope. At low magnification in my 15-inch reflector (37-cm) the persistent glow looked like a brand new sausage-shaped diffuse nebula in Cassiopeia. Trains form when a meteoroid’s hypersonic velocity through the upper atmosphere ionizes the air along the object’s path. When the atoms return to their rest states, they release that pent up energy as a glowing streak of light that gradually fades. The train in the photos expands and changes shape depending on the vagaries of upper atmospheric winds. Absolutely fascinating to watch. Most activity occurred between 12:30 and 2 a.m. for my time zone in the U.S. Midwest. Surprisingly, the action dropped off around 2 and stayed that way until 3. I did get one ‘farewell Cam’ on that last look up before turning in for the night. Malcolm Park of Toronto captured a bright Camelopardalid this morning. The team working with Gianluca Masi at the Virtual Telescope Project reported a number of bright meteors as well but no storm. We share several of their photos here. As more information comes in, please drop by for a more complete report. You can also check out Dirk Ross’s Latest Worldwide Meteor News for additional first hand reports. Before signing off for the moment, I’d like to ask your help in explaining a strange phenomenon I saw while out watching and photographing the shower. Around 1 a.m. I looked up and noticed a comet-like streak about 15-degrees long drifting across northern Leo. My first thought was meteor train – a giant one – but then I noticed that the center of the streak was brighter and contained a starlike object that moved in tandem with the wispy glow. I quickly took a couple pictures as the streak traveled north and expanded into a large, nebulous ray that persisted for about 1o minutes. There were no other clouds in the sky and the aurora was not active at the time. Can anyone shed light on what it was?? UPDATE: According Mike McCants, satellite tracking software developer, the plume is fuel dump connected to the launch of a new Japanese mapping satellite. One never knows sometimes what the night has in store. 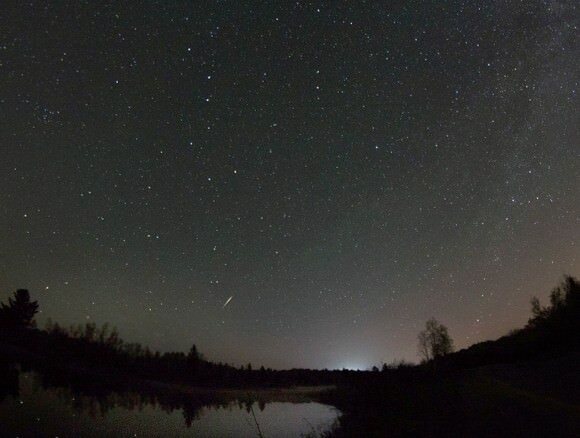 A rare daylight meteor streaked across the skies over southern Ontario, Canada and the U.S. Northeast during the afternoon of Sunday May 4, 2014, with brightness “rivaling that of the Sun,” said the American Meteor Society. Reports of a bright fireball followed by a loud sonic boom were reported on social media, and several dashcam videos emerged showing the fireball, showing an unusual vertical trajectory. Experts estimated the space rock that caused the excitement as being about half to one meter in diameter and exploding with a force of 50 tons of TNT energy. Canadian meteor expert Peter Brown, a professor at the University of Western Ontario said in the Winnipeg Free Press that he is confident that the fireball was large enough that some meteorite fragments may have hit the ground. . Compared to the meteor that exploded over Chelyabinsk, Russia in February of 2013, that’s quite small. That meteor’s explosion shattered windows and injured 1,000 people. See more videos, tweets and images below, and you can read a liveblog of the event (with lots of links) by Daniel Fischer (@cosmos4u). Sonic boom you felt. RT @island_gurl75: #meteor strikes or explodes near #Peterborough. We felt 4 big bangs, felt like a car hit the house! Read more news reports at the American Meteor Society, Globe and Mail, and Global News. The meteoroid seen over the UK on September 21, 2012 has created quite a sensation – make that a several sensations. First, the bright object(s) in the night sky were seen across a wide area by many people, and the brightness and duration – 40 to 60 seconds reported and videoed by some observers – had some experts wondering if the slow moving light-show might have been caused by space junk. But analysis by satellite tracker Marco Langbroek revealed this was likely an Aten asteroid, asteroid which have orbits that often cross the Earth’s orbit, but their average distance from the Sun is less than 1 AU, the distance from the Earth to the Sun. Atens are fairly unusual, making this a rather unique event. But then came another analysis that seemed to be so crazy, it might have been true: this meteoroid may have skipped like a stone in and out of Earth’s atmosphere, where it slowed enough to orbit the Earth until appearing as another meteor over Canada, just a few hours after it was seen over the UK and northern Europe. How amazing that would have been! And there was much speculation about this possibility. But, it turns out, after more details emerged and further investigation ensued, it is not possible that the space rock could have boomeranged around the world and been seen in again 2½ hours later over Canada. However, the current thinking is that at least one or two of the largest pieces retained enough velocity that they went into an elliptical Earth orbit, and went perhaps a half an orbit around Earth. “At first it seemed natural to consider a possible dynamical linkage (between the UK and Canadian meteors), partly because the precise location and time over Quebec/Ontario was not well-known early on,” said aerospace engineer and meteor expert Robert Matson, in an email to Universe Today. Matson worked extensively with Esko Lyytinen, a member of the Finnish Fireball Working Group of the Ursa Astronomical Association, to analyze the possible connection between the September 21 UK fireball, and the Quebec fireball that followed about 2½ hours later. At first, the time of the fireball sighting over southeastern Canada and northeastern USA was in doubt, but two Canadian all-sky cameras from the Western Meteor Physics Group captured the meteor, providing an accurate time. “And once I triangulated the location to a spot between Ottawa and Montreal, a linkage to the UK fireball was no longer possible due to the longitude mismatch,” Matson said. Additionally, the 153-minute time difference between meteors places a strict limit on the maximum longitude difference for a “skipping” meteoroid of roughly 38 degrees. This would put the final perigee well off the coast of Newfoundland, south of Greenland, Matson added. More facts emerged, putting a death knoll on the connection between the two. Image of fireball taken on Feb. 25, 2004 by the Elginfield CCD camera from the University of Western Ontario. Just how high the apogee altitude was depends on how much the meteoroid decelerated over the UK, Matson added. The most likely scenario, Matson said, is that the surviving portion(s) of the UK meteoroid came in for good less than 2½ hours later, with the only possible locations during that window being the North Atlantic, Florida, Cuba, Central America, the Pacific, New Zealand, Australia, the Indian Ocean, the Arabian Peninsula, Turkey or southern Europe. Of these, the northern hemisphere locations would be favored. So perhaps we haven’t heard the last of this meteoroid! As crazy as the bouncing bolide sounds, it has happened in the past, according to Kelly Beatty at Sky and Telescope, who mentioned at least one instance where a large meteoroid streaked across the sky and then returned to interplanetary space. This sighting took place over the Rocky Mountains in broad daylight on August 10, 1972, and the meteoroid came as close as 35 miles (57 km) above Earth’s surface before skipping out into space. Beatty added that its velocity was too fast to become captured and return again. For reasons yet unknown, the rate of midnight fireballs increases during the weeks around the vernal equinox. It’s a beautiful display, but where do they come from? Last month, we reported on a network of fireball cameras that NASA is building, which is now tracking incoming fireballs — and just in time, too, for the fireball season. This video is part of a new series by NASA called ScienceCast, which will be a weekly feature highlighting a topic in NASA science news. Via the Astro Bob and Rocks From Space websites comes news that the first meteorite has been recovered from the spectacular fireball that was seen over seven states on April 14, 2010. Brothers Christopher and Evan Boudreaux from southern Wisconsin located a piece of what was likely a meter-wide space rock, according to NASA’ Near Earth Object office. Astro Bob said that pieces of meteorite from Wednesday night’s amazing fireball appear to have fallen over the Livingston, Wisconson area between Platteville and Avoca. If you’re in that area, maybe you’ll have time to do a little meteorite hunting this weekend. But always get permission before going on any private property. The image above, as well as a close-up of the meteorite, below, are courtesy of Michael Johnson, who hosts the Rocks From Space website Johnson said that according to Mike Farmer, a professional meteorite hunter, the meteorite appears to be an H chondrite. The first recovered meteorite from the April 14, 2010 fireball. Photo by Terry Boudreaux (c) 2010, via Rocks From Space, used by permission. Astro Bob indicated there is a meteorite for sale on e-Bay claiming to be from the April 14 fall, but it is not, so beware. According to NASA’s NEO office, data collected by scientists at NASA’s Marshall’s Space Flight Center in Huntsville, Alabama indicate the parent body of the fireball was not associated with the Gamma Virginids meteor shower, which was taking place at the time the fireball entered the atmosphere. Instead, the small space rock more than likely originated from somewhere in the asteroid belt. The head of the NEO office, Don Yeomans, said that when the fireball disintegrated high in the atmosphere, it released energy equivalent to the detonation of approximately 20 tons of TNT. Here’s a mash-up of webcams, dashboard-cams etc. that captured the fireball. Lots of buzz this morning about a huge fireball seen late April 14, 2010 over at least seven midwestern US states including Wisconsin, Michigan, Iowa, Minnesota and Illinois (that’s where I am!) The video above was taken from the dashboard camera of a police vehicle in Howard County, Iowa, which is near the Minnesota border. Another video, from the University of Wisconsin-Madison caught the meteor. The flash even showed up on a National Weather Service Doppler radar image from the Quad Cities in Iowa. The image shows the fireball’s smoke trail caught at 24,000 feet (the small squiggle near Grant and Iowa counties.) Several reports (this one too!) of booms, shaking and flashes have been posted online. Did you capture any images or video? First, you might want to contact the International Meteor Organization, a nonprofit that watches over amateur meteor sightings. But we’d like to see them too! Post a link in the comments or send an email to me.